Railway companies looking for new on-board electronic equipment or intelligent transportation systems should consider products that follow specific requirements in terms of operating temperature, shock and vibration resistance, EMC, and so on, in order to guarantee consistent and reliable performance in harsh and contaminated environments such as trains. That is why on-board electronic devices like IoT gateways, edge computers and intelligent transportation systems should comply with the parameters defined by specific railway certifications. We will discuss three key standard requirements to meet the needs of today’s on-board railway and rolling stock applications..
How can people counting make events run smoothly? Whether it’s venue, catering, speakers, delegates or topics, many factors have to come together in just the right way to create a truly successful conference or exhibition. Weeks, or even months, of planning go into ensuring every detail of even the smallest event is the best it can be. So, once we have everything in place and the conference is underway, how do we know that what we’re doing is working and how can we tell which areas of a show are the most engaging? We can ask people for their feedback and send post-event surveys all we like but nothing beats hard data that tells us, in real time, what we need to know. At Red Hat Summit 2015 in Boston, one of the biggest open source technology events in the world, we saw just how easily this issue of event analysis can be addressed. In the United States alone there are over 26 million commercial vehicles on the roadways and in operations1, ranging across the spectrum of logistics and heavy moving equipment to agriculture equipment and waste management vehicles. In today’s connected enterprises, these commercial fleets are managed through tightly integrated operational systems that perform a multitude of services, including fleet management (automatic vehicle location, asset tracking, route optimization), monitoring of vehicle health and diagnostics, vehicle operator console operations, electronic data recording, and video capture. These systems improve operational efficiencies, reduce costs, and enable delivery of enhanced services. Enabling technology for all of these applications is the “Mobile Edge”, the ability to extend an enterprise’s operational systems to mobile computing platforms on deployed fleet vehicles. A variety of options present themselves to both operators deploying these systems and technology companies offering communications solutions to those operators. In choosing the right solution for the Mobile Edge, the operator or integrator must consider both hardware and software aspects of their system requirements. Imagine how many times that expression is heard every day. It likely conjures up images of a Swish Viennese Cafè but the truth is vending machine technology has advanced significantly to include coffee and a myriad of other snack options. In the U.S. alone the vending machine business is a $7 billion industry with more than 5 million machines and forecasters suggest by the end of the year there will be more than 53 million machines globally. The same machine that dispenses coffee can dispense soft drinks, water, candy bars, chips and other snacks. In the past the items vending machines actually did dispense was hit and miss based on what was actually available, if you had the right coins and if they were actually accepted by the tin box in front of you. In those distant days you probably thought – who on earth manages these vending machines, why don’t they ever work, why don’t they have what I want and when is the service technician coming? is it not time that organisations with existing base of refrigeration assets turned to the Internet of Things to put in place retro fitted sensors to monitor the performance and key indicators on. Identifying potential problems early can help to reduce failure rates and save on energy, food waste and potentially damaging headlines. With Everyware Cloud – the M2M / IoT Integration Platform – and Intelligent Edge Gateways Eurotech can help customers connect and monitor any type of asset. Knowing the assets’ status, the organizations can quickly react to prevent a failure or minimizing its consequences. While many M2M/IoT systems are complex, an environmental monitoring system provides an excellent example for the various sensors and devices that must be combined to create a cohesive M2M/IoT system. Consider a cloud connected environmental monitoring system with high precision air pollution sensors and real time data access. The system must be rugged and compact to withstand the elements and designed to monitor traffic, industrial, construction and urban areas for temperature, gaseous pollutants, particulates, electromagnetic fields, radioactivity, and sound pollution. To add another layer of complexity, the system must be built to seamlessly connect to the cloud and send data from the field to the business application in real time. The M2M/IoT marketplace is full of hundreds of piecemeal technologies that can be cobbled together from different vendors to form a solution, but the environmental monitoring system is best developed using the Multi-Service Gateway approach (Figure 1). Figure 1: Multi-Service Gateways consolidate multiple business–relevant tasks. A Multi-Service Gateway is ideally suited for the environmental monitoring system to connect sensors, actuators, and meters to the business enterprise. It enables bidirectional communication between the field and the cloud and offers local processing and storage capabilities to provide offline services and near real time management and control of the devices in the field. The edge of the IoT is where solutions connect, communicate and interact using sensors, actuators, gateways, agents and controllers. As technology advances vendors are touting “advanced management capabilities” for these devices at the edge. These capabilities vary, ranging from the simple ability to turn a device on and off to more complex actions such as updating software, managing Wifi connections, configuring security policies or changing data parameters. IoT projects present many challenges, even when the hardware is designed exactly to customer specifications. 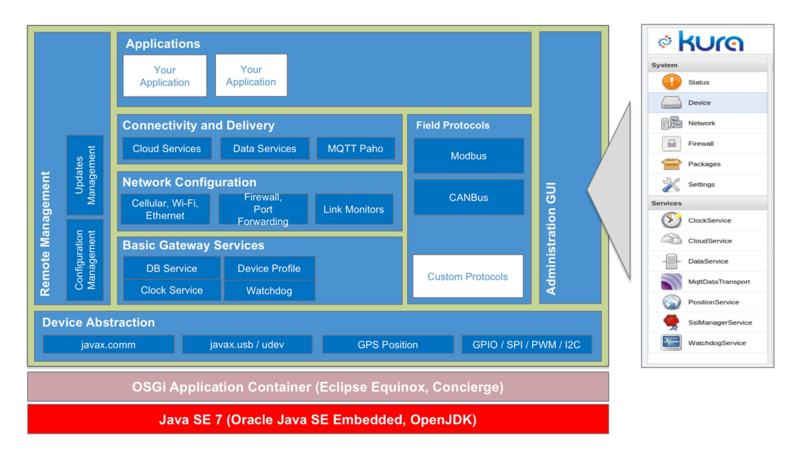 Building on proven architecture and software building blocks that would require many years to develop, the use of a Java-based IoT application framework will result in shorter, more deterministic device software development. Using an IT-centric approach to implement the device logic in smart edge devices improves both device management and embedded application management. Once this standard software platform is in place, connecting and getting business relevant data to the cloud is simpler than it ever has been before. An advanced software framework that leverages OSGi and Java both isolates the developer from the complexity of the hardware and communications infrastructure and also complements the Multi-Service Gateway hardware for an integrated hardware and software solution. It’s easy to slip into the habit of thinking of the Internet of Things as a highly technical, industrial tool at home in factories, or fleets of high powered vehicles, but who’d have thought it can also help plants grow? It can be near impossible to predict what any one growing season will bring. So much is at the mercy of the weather, availability or certification of crop protection products and numerous other factors which have to be given a ‘best guess’ in order to plan for them. The best way to predict the most likely outcome in any season is, of course, experience. We constantly read that as healthcare improves, and mortality rates shrink, our world is becoming more and more overpopulated. We are told that we are using natural resources faster than they can rejuvenate and that climate change is set to devastate the world in which we live in just a few short decades. So how can we quantify the impact each of us has on our environment? We’re all familiar with the term ‘carbon footprint’ but what does it mean to us really? If we could see, in real time, the immediate impact we have on our surroundings, maybe we’d be more likely to change our behaviour for the better. Measuring people traffic has already become a key intelligence metric for retail, transportation, logistics and many other industries. Correlating real-time people patterns with other business metrics of course leads to powerful insights on sales conversion rates as well as the best way to optimise distribution of assets. What has gone previously unexploited is the opportunity to establish the effect of growing numbers of people on the environment and resources around us. At EclipseCON 2014, Eurotech collaborated with Actuate and the Eclipse Foundation to produce a real time, real life demonstration of just how easily an IoT solution can not only be built and implemented, but can actually start providing meaningful data.